"Bats get a pretty bad rap, but they’re actually a kind of natural pesticide (the way ladybugs are for aphids)." I stumbled upon this project when I was researching 2017 gardening trends for the Northwest Flower & Garden Show. I was surprised to see that bat houses was one such trend! With the growing shift towards organic gardening and avoiding pesticides, people are looking for all-natural ways to eliminate bugs in their gardens. Bats get a pretty bad rap, but they’re actually a kind of natural pesticide (the way ladybugs are for aphids). Bats fly around at night and eat all the bugs (the ones that attack plants, plus the annoying ones like mosquitos). Best of all, bats are nocturnal, so if you don’t like them, you don’t ever have to see them. 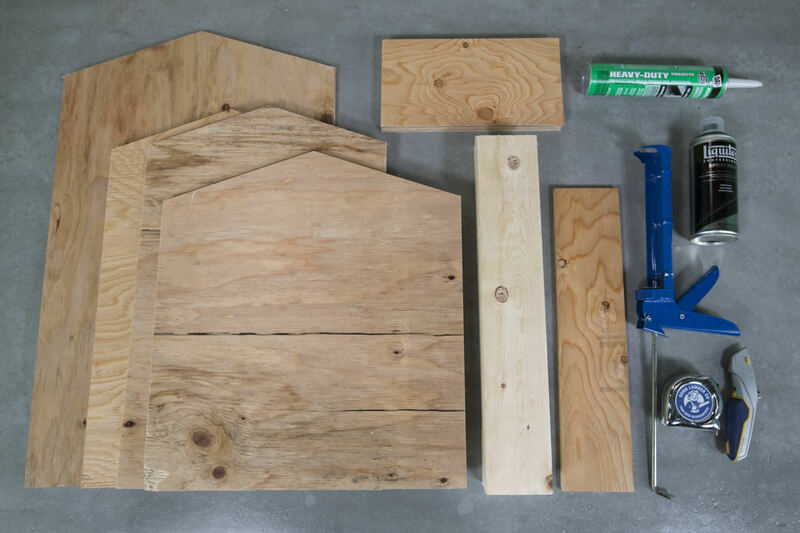 I thought this project was going to be like building a birdhouse: pretty simple, with not a lot that could be messed up. It wasn’t like that at all. 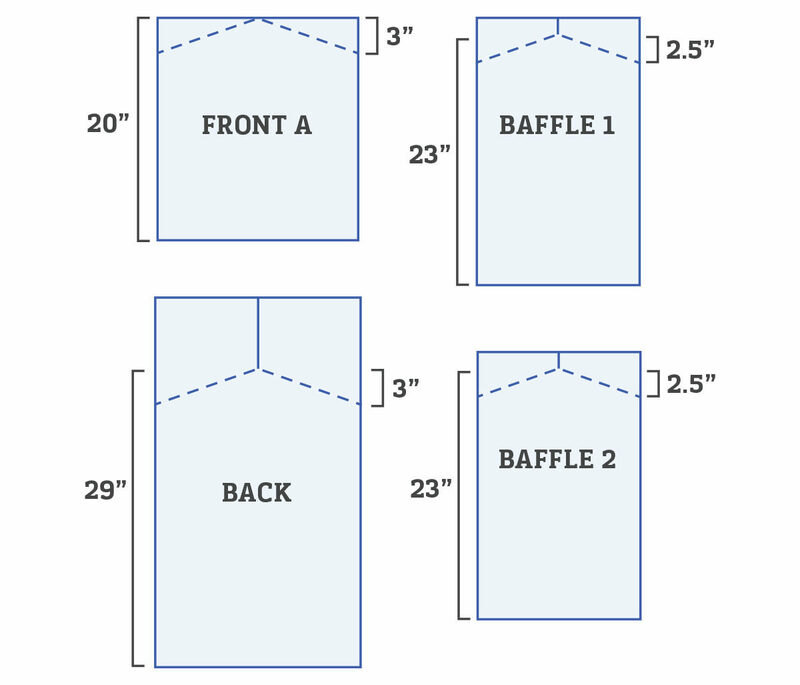 As it turns out, creating a welcoming home for a bunch of bats is a precise science (our house is 26” by 18” with three 1/4” chambers and can house around 70 bats!). I found a lot of the information for this project from Bat Conservation and Management. 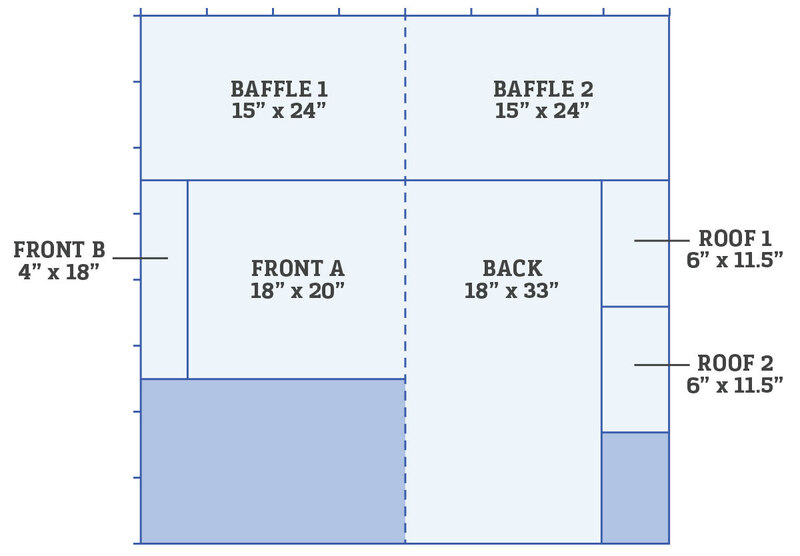 Their website has a ton of really useful information, including their “Why Do Some Bat Houses Fail?” article, which helped me design our no-fail bat house. Bats are pretty picky for being four-inch-tall, insect-eating, nocturnal creatures. A lot is required for a properly equipped house. It has to have a landing pad on the bottom, a little piece that sticks out where they can land and climb up into the house; it has to be at least 20” tall and 14” wide, with internal chambers where—because bats are apparently cuddlers—they can roost closely to each other; the chambers need to be between 3/4” to 1” wide; there has to be a vent at the bottom so if it gets too hot they can move down and cool off instead of abandoning the house; and you have to seal it tightly so no water can get in. That’s a lot, but it’s worth it not to skip steps. Because what’s the point of building a bat house if the bats don’t come? Cut the roof pieces at a 20° angle. Cut two identical pieces from the two-by-four with one straight cut and one 20°cut so that the length from the straight cut to the bottom of the angled cut measures 21". Part of the reason I was excited about this project was that it gave me the opportunity to try out something I’ve never done: make angled cuts with a circular saw. (Usually I use my miter saw.) Circular saws have a little knob you can adjust between 0° and 45°. It tilts the saw blade while keeping the foot flat on the wood. 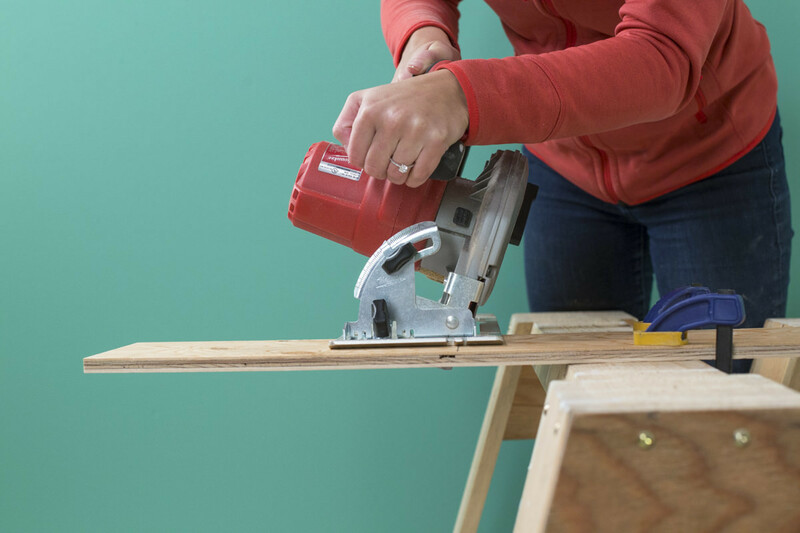 If you’re more comfortable with a miter saw, there’s no reason not to use one, but the circular saw made it so easy. 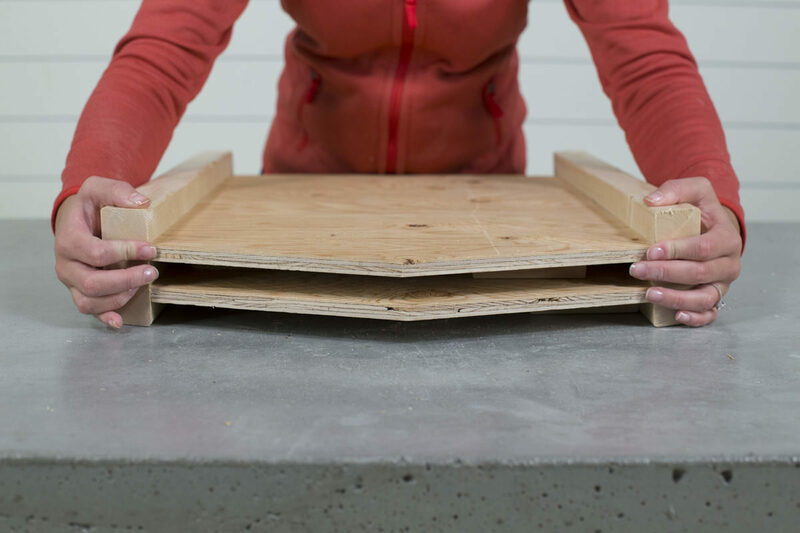 What’s simple about this project is it’s just a piece of plywood, a 2 x 4, and a circular saw. Don’t be intimidated by it! 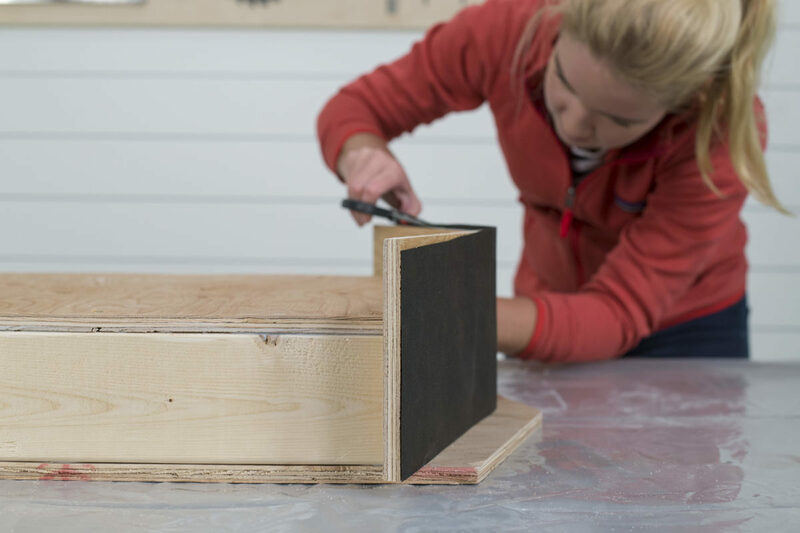 Use a utility knife to scratch up the wood in a crosshatch pattern on both sides of the baffles (the inside pieces that divide the chambers) and on the inside face of the front and back pieces. Normally you’d try to buy the smoothest possible wood, and then sand it to get it even smoother, so this seems a little counterintuitive. But this step is very important because the scratches give the bats something to grab onto. Most wood from the lumberyard is too smooth for the bats to be able to climb; you have to scratch up all the pieces inside the house so there’s somewhere for their feet to grip. The crosshatch pattern is the most effective way to do this. 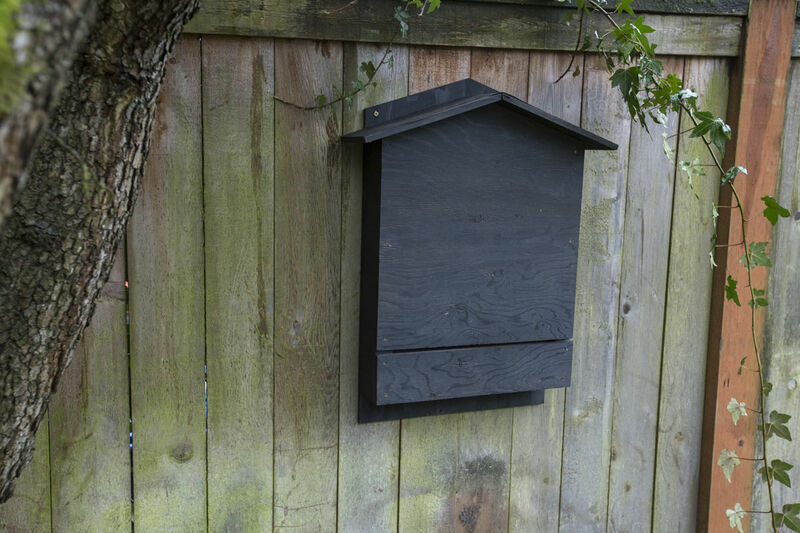 The back of the bat house sticks out at the bottom—that’s the landing pad. That part needs to be particularly scratched up because that’s where they will land. 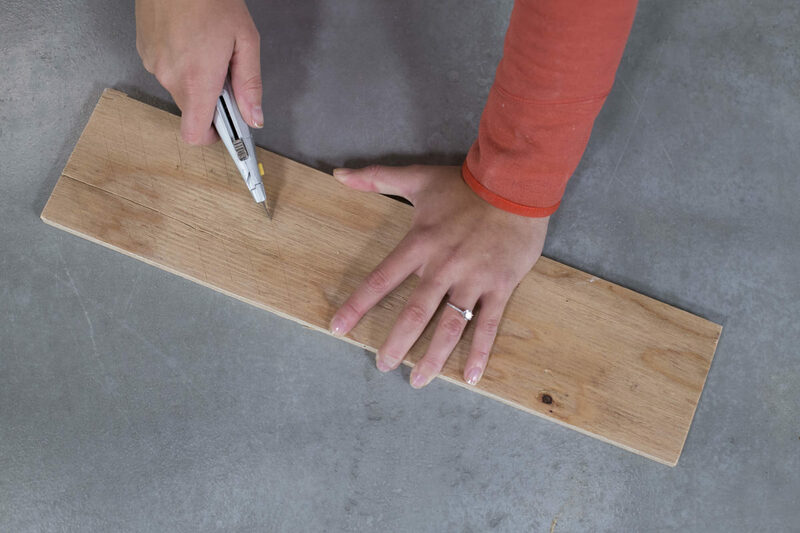 Lay down the two-by-fours next to each other positioned on their sides so that the angled cuts point toward each other (creating the angles for the roof). Lay down some 3/4” scrap material in between the two-by-fours as spacers for the two baffles. It should be layered from the bottom up spacer-baffle-spacer-baffle. After the baffles are secured, remove the spacers from in between the compartments. 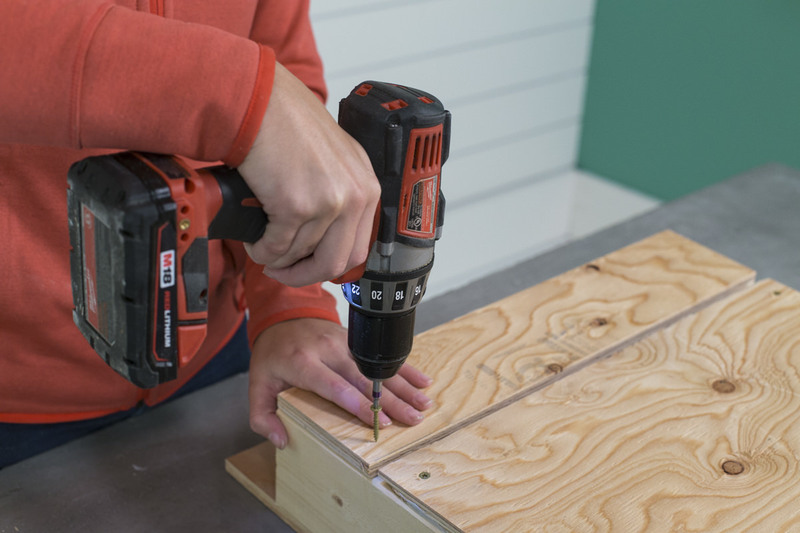 Apply construction adhesive to the sides of the two-by-fours and position the back of the house (the 29” tall piece) on top, so that about 2” of the back sticks up over the top and about 3” sticks out over the bottom. 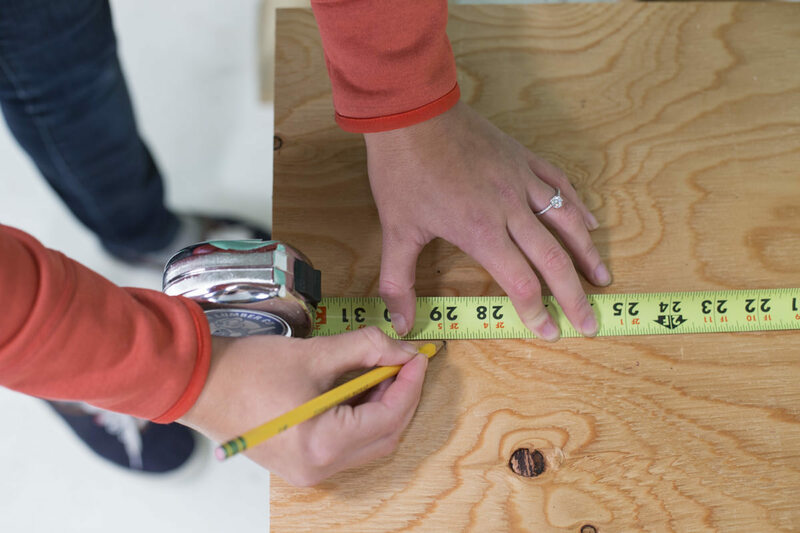 You can eyeball these measurements; they don’t have to be precise. 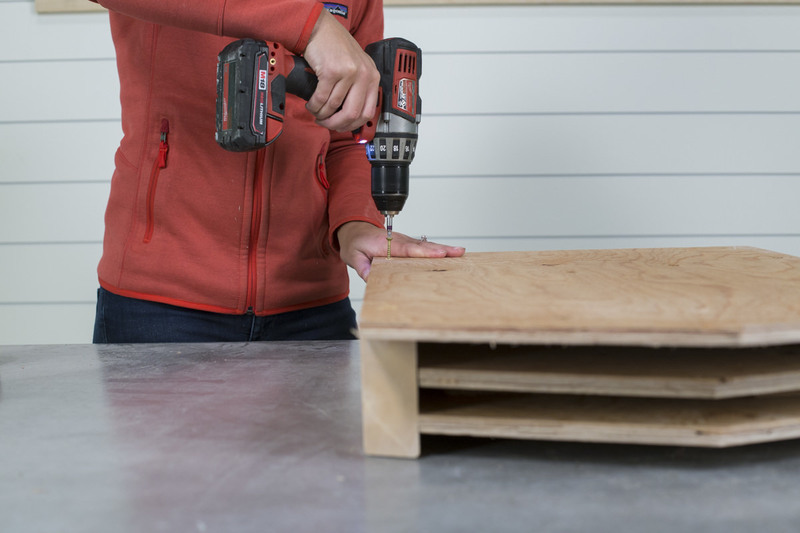 Secure the back to the two-by-fours with 1 1/4” screws. This piece of wood sticks out on the bottom to make the landing pad and on the top so you have something to drill through to attach it to a post or the side of a barn or house. Flip the house over so that it’s lying on its back. 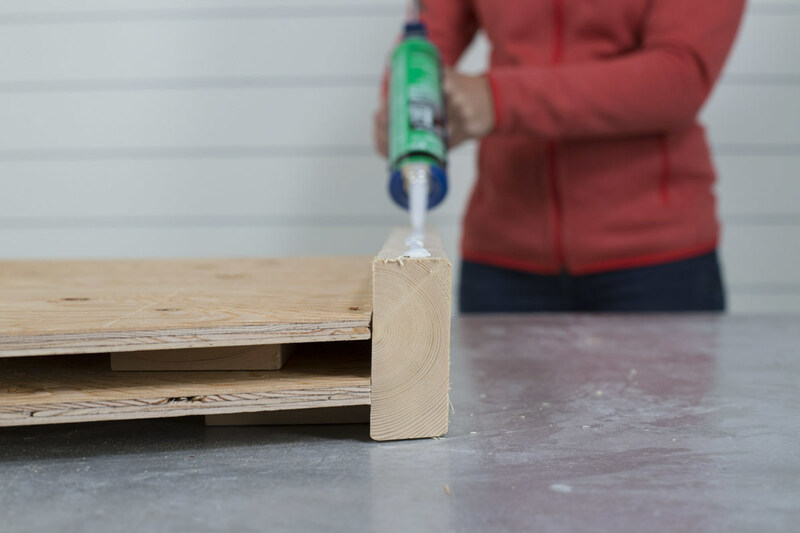 Run construction adhesive along the sides of the two-by-fours and lay the front (“front A”) down with the top lining up flush with the two-by-fours. Screw it in place with 1 1/4” screws. 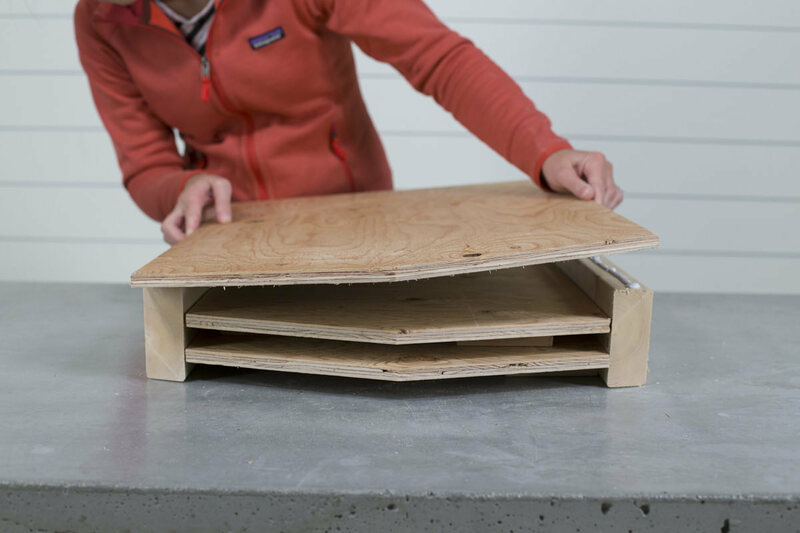 Attach the bottom part of the front (“front B”) about 1/4” from the bottom of “front A.” This creates a vent that cools the bat house. Secure with screws. 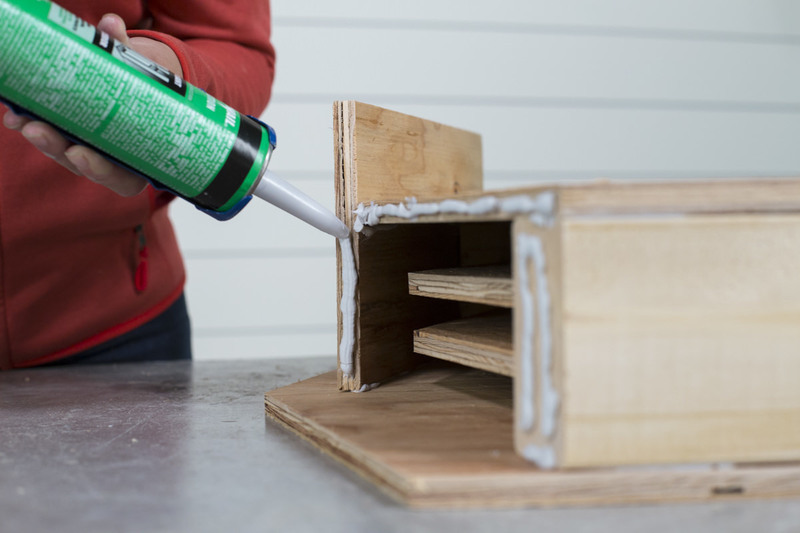 Apply construction adhesive along the top edges of the house and position the roof. Pre-drill holes and secure the roof with many, many screws to make sure everything is completely and utterly sealed. Cut out a piece of felt paper for the roof, and glue it on with construction adhesive. Felt paper is the roofing paper that lives underneath your shingles. Here, we’re gluing it to the top of the roof as further protection for the bat house. You can purchase felt paper by the foot and it's inexpensive. Note: Why did I say “many, many” screws? 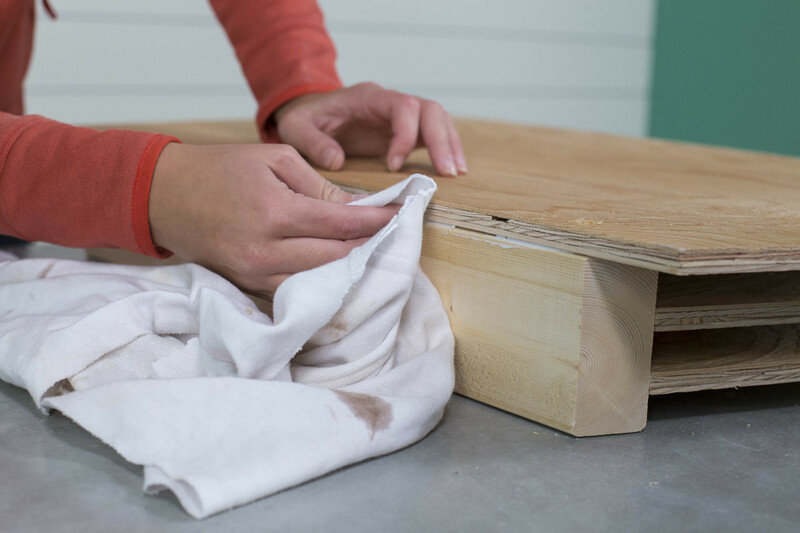 If your roof isn’t sealed and leak-proof, it's one of the big ways you can mess up your bat house and make no bat ever want to live in it. The bat conservation society suggests inserting screws every inch or so, so that the wood doesn’t have any chance to warp and break the seal. At this point we applied caulk around all the edges of the roof to ensure everything is double- or triple-sealed. We did this on every seam, underneath the roof, and then again on the back edge of the roof and the backboard. Wait for the caulk to dry before you paint it. 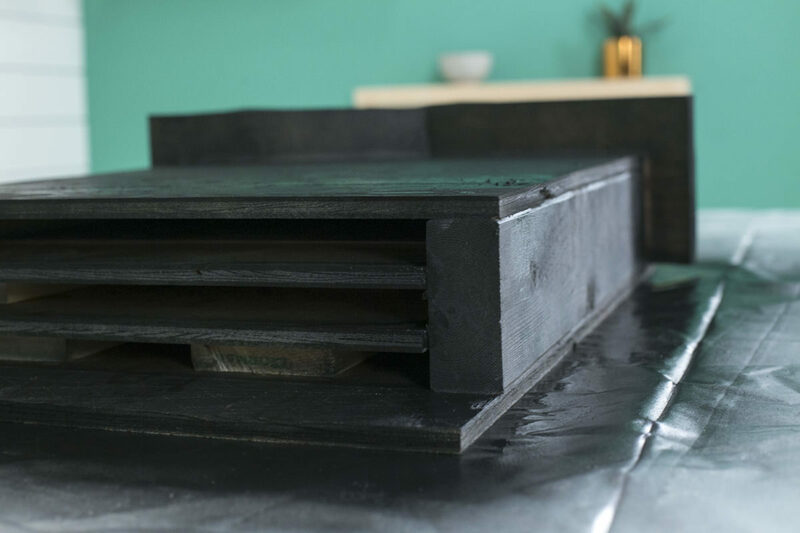 After the construction adhesive and caulk have fully dried (it should take about 24 hours), lay out the house on a plastic drop cloth and spray paint it with a black, water-based paint (water-based spray paint is much more animal-friendly than the standard oil-based spray paint. It got the seal of approval from the bat conservationists). 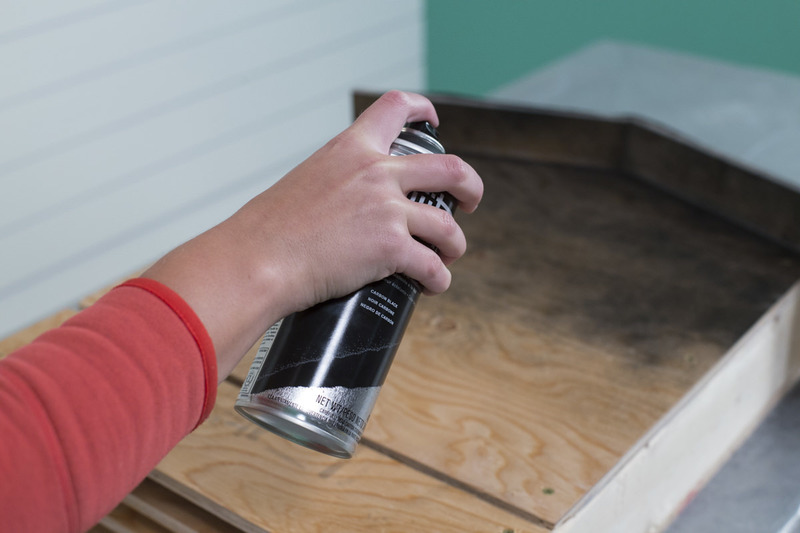 Most hardware stores don’t carry water-based spray paint; you have to go to a craft store to get it. 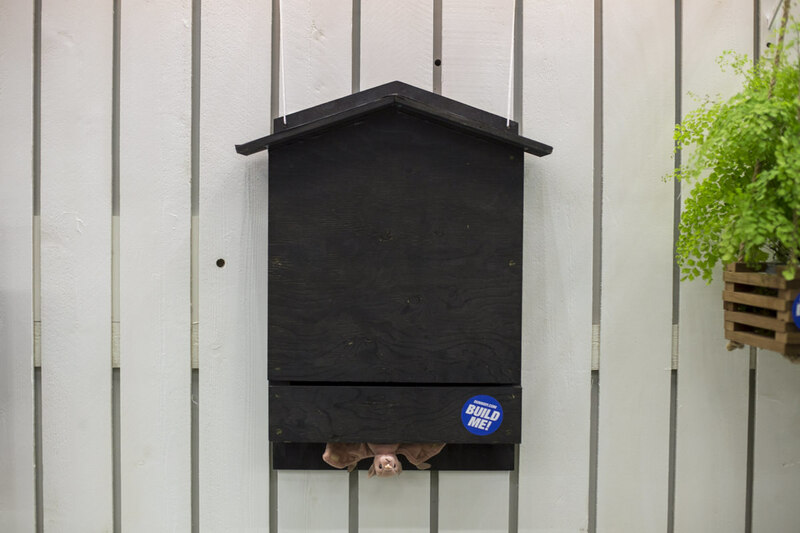 We came up with a design that was different (and, I think, more attractive) than the typical bat house one can buy, while still adhering to the copious guidelines from the bat conservation people. Bats are very, very picky animals, and it takes a lot to build a house for them. I don’t know where they’re living out in the wild that’s meeting all these requirements! I loved this kind of project because it makes me want to brainstorm plans and put them down in a blog post. It's a stimulating challenge to figure out how to do all the steps correctly, and then communicate the steps in a clear and fun way. I really enjoy projects like this, and I hope it’s valuable for you! Holiday lights bring joy and light to a dreary winter, awaken childhood memories for adults, and build memories for children. Displaying these temporary lights can be a fun project of design, shopping, and installation, but it can also be a daunting process.